If you're afraid of spiders avoid this movie but if you're a fan of either Scarlett Johansson or the campy 1950s creature-from-the-black-lagoon genre of movie making, rent this tout suite. Directed by Kiwi Ellory Elkayem, who makes this type of tongue-in-cheek sci-fi schtick his bread and butter, it stars David Arquette as Chris McCormick, the son of a wealthy Arizona miner who returns to his hometown days after giant mutant spiders start over-running it. His love interest is single mom Samantha Parker (Kari Wuhrer), the town's sheriff. Despite the film's you-see-everything-coming approach, it works thanks to Scarlett's presence (and even here she is a presence), the endearing quality of Harry Potter look-a-like Mike Parker (Scott Terra) and a perfectly played Deputy Pete Willis (Rick Overton). 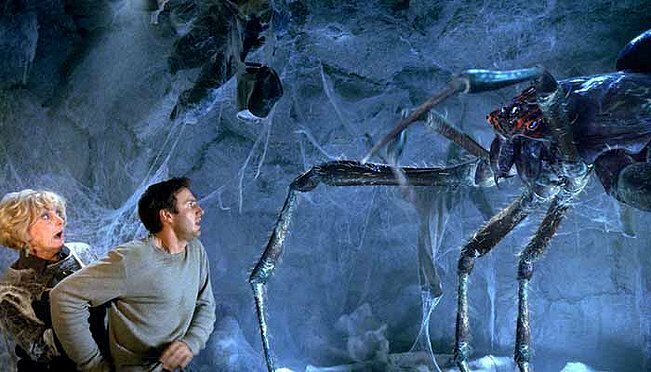 Is Eight Legged Freaks a good film? Hell no! But as pure entertainment on a Sunday night, you can't beat it.